A washing machine’s Pressure Switch detects when the washer’s water level reaches the correct setting. It does so by measuring the air pressure inside of a small tube connected to it. When a washing machine fills up with water, it needs a way to know when it’s full. A “Pressure Switch” in a washing machine does this by measuring the air pressure inside of a small tube that is connected to it. When the pressure switch breaks, the washing machine can potentially overfill and flood your laundry room. 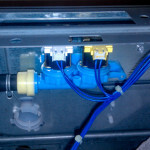 This is the story of a Maytag washer water valve repair somewhere in San Diego. This washer could not properly fill itself with water. The water valve in the washing machine is responsible for allowing enough water to be able to come into the washer and fill it with water.